DC Comics is due for a feel-good win in the box office — and WTOP's Rob Woodfork says they may just have it in the form of a man-child in tights with an acronym for a name. The DCEU (DC Extended Universe) has indisputably been playing catch-up to the rival Marvel Cinematic Universe, and though “Shazam!” feels a bit like an answer to Marvel’s “Guardians of the Galaxy,” it does well to buck the trend among DC Comics’ darker, better-known heroes with tragic origin stories — the murder of Batman’s parents, the death of Superman’s home planet, Aquaman put in the middle of an undersea civil war — by introducing one of its lighter (yet most-disputed) characters to its live-action film entity with childlike enthusiasm. The character Shazam has fought for relevance throughout his existence; originally named Captain Marvel when he debuted in 1940, the name was later changed because of the trademark conflict with the Captain Marvel owned by Marvel Comics — a character you may recall was a pretty big deal in theaters last month. “Shazam!” comics were shelved in the 1950s because of a yearslong lawsuit over whether the character was too similar to Superman. 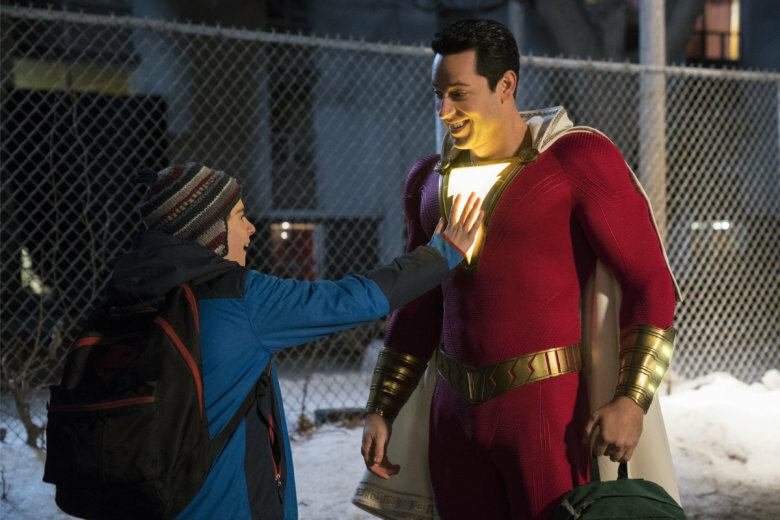 “Shazam!” is set in present-day Philadelphia, centered around orphan teenager Billy Batson (Asher Angel), who bounced around foster homes after losing his mother. Billy is the stereotypical good-hearted troublemaker. Early on, we meet him pranking cops for a worthy cause. Billy lands in a cozy group home run by Rosa and Victor (Marta Milans and Cooper Andrews), former group home kids themselves. It’s there that Billy reluctantly becomes the seventh member of a multicultural family highlighted by fellow foster kids Freddy (Jack Dylan Grazer, whose witty banter and superhero expertise steals the show) and the hug-thirsty-and-adorable Darla (played by Faithe Herman of TV’s “This Is Us”). Billy’s schoolyard defense of the monoplegic Freddy leads him on a subway ride that magically ends in the mystic lair of the old wizard Shazam (Djimon Hounsou in an over-the-top disguise), who has been in a decadeslong search for someone worthy to wield the power to ward off the seven deadly sins (prominently displayed in the cavern by gargoyle-like statues). All Billy has to do is grab his staff (to which he replied as any teenager would), and say the name “Shazam!” — which is actually an acronym for the six immortal elders from whom he draws his powers: Solomon, Hercules, Atlas, Zeus, Achilles and Mercury. The result is a lightning-induced transformation into an adult demigod (portrayed by Zachary Levi). Of course, gifting a teenager with this level of ability lends itself to some shenanigans, and Billy’s winding road from adolescent to superhero includes a montage of him testing out his newfound powers, a self-made crisis and a whole lot of lightning bolts from his fingers — all the while, the evil Dr. Silvan (Mark Strong) is angling to steal Billy’s powers for reasons made clear in the film’s opening minutes. The film is directed by David F. Sandberg, who mainly did short films before his 2016 directorial debut “Lights Out.” Many have compared “Shazam!” to a modern-day version of the 1988 classic “Big,” which Sandberg is quoted as saying was his aim. He certainly hit the mark. Even though the movie largely takes place in the present, it certainly has a nostalgic feel to it, thanks in part to songs like Eminem’s “My Name Is” and Naughty By Nature’s “Feel Me Flow” along with some of the compositions of Benjamin Wallfisch (“Dunkirk,” “Batman v. Superman: Dawn of Justice,” “12 Years A Slave”). In an interesting note, the film’s executive producer is Dwayne “The Rock” Johnson, who has long been rumored to play “Shazam!” villain Black Adam, a character who was possibly referenced early in the film, and should be a solid bet to be Billy’s next adversary in a sequel. At 2 hours, 12 minutes (and you’ll stay for all of it because there’s not one, but two post-credit scenes), “Shazam!” feels a tad longer than it needs to be for what is pegged as a fun, family movie. But the inevitable superhero throwdown at the end is worth the wait, especially once we see the contributions of Billy’s foster family. Unlike Batman, Superman and Aquaman — all of whom get some sort of shout-out in the movie — “Shazam!” realizes his superhero potential because of the family he’s gained, not the one he’s lost. And that lighter, more refreshing tilt is DC Comics’ gain.